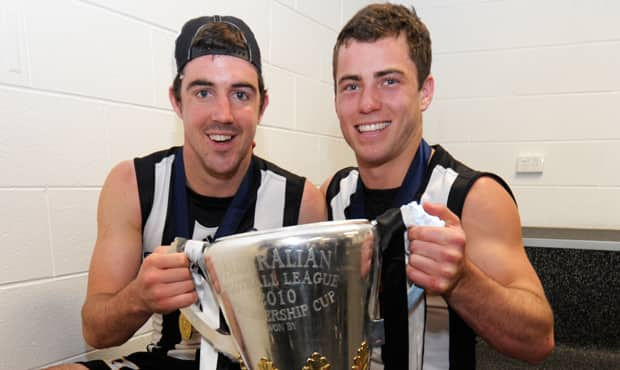 Steele Sidebottom and Jarryd Blair celebrate their 2010 premiership triumph in the MCG rooms after the match. It’s a term that gets thrown around in football far too often. If, if, if. All the different outcomes and different results. There are so many what ifs, and if onlys, in football, sport and life. But it takes a rare person to be able to seize the opportunity to turn an if only into a lifelong dream. Jarryd Blair, though, is a man who makes things happen. “If he was another two or three centimetres taller … he would have been drafted,” is what recruiting boss Derek Hine said after he took Blair with pick No. 27 in the Rookie Draft of December 2008. If only he was taller. So everyone thought. Fortunately, Hine, and Blair, knew otherwise. Eddie McGuire and Jarryd Blair celebrate Collingwood's 2010 premiership. Height was always going to be a key theme to the narrative of Blair’s football career. He stands 174cm tall, a height at which only 13 Collingwood players have managed to play senior football over the past 35 years. But Blair’s career has been anything but conventional. A total of 159 players entered the AFL system in the 2008 National, Pre-Season and Rookie Drafts. Blair, the 111th player selected in that intake, has played 157 games in his first 10 years in the game. Only 23 of those selected have played more. Back then, it wasn’t as easy for rookies to play a senior game, let alone forge a senior career. But there was always a sense Blair might be different. He, along with fellow 2008 draftees Steele Sidebottom, Dayne Beams and Tristan Francis, gave Collingwood’s VFL team a harder edge in the first half of 2009. While Sidebottom and Beams quickly moved into the seniors, Blair and Francis, who had co-captained Gippsland Power in 2008, made their presence felt under coach Gavin Brown and helped send the team into a Preliminary Final. For Blair, that was a precursor to far bigger things to come. Working closely with VFL leaders Brown, who told reporters Blair was “killing them – he’s been really training the house down,” in February of 2010, and Paul Licuria, it was at the grassroots that he put the finishing touches on his football product. His path to 2010 glory is well documented, but for a series of what ifs and sliding doors, it could have been ever so different. Blair sings Good Old Collingwood Forever after his debut against West Coast in round 14, 2010. Players rarely get more than two years to prove themselves on a rookie list, meaning time was of the essence. Midway through that famous year, Blair received his senior opportunity. He was a Morrish Medallist in the TAC Cup, a rookie selection despite conventional recruiting wisdom and a state league representative during his second season on an AFL rookie list. So why wouldn’t he make the leap into the big time? The call was made to include him in the AFL side to take on West Coast under the Etihad roof in round 14. At that point in time, the Eagles weren’t all that flash. They entered the match second last on the ladder and were hammered by 83 points, with Collingwood recording 35 scoring shots to 17. Blair got his chance as a late inclusion for Steele Sidebottom, who pulled out late with a calf concern. He would only miss nine of Collingwood’s next 145 games. Yes, he’s a man who makes things happen. Over the course of the past nine years, Blair has been one of the mainstays during a time of change at the Holden Centre. In fact, in the 162 games coached by Nathan Buckley since 2012, Blair, with 121 appearances, is second only to Steele Sidebottom and Scott Pendlebury for most games played under Bucks. Putting it all on the line for the Black and White stripes. Since debuting in 2010, as players, coaches and staff have come and gone, and the team has played in four Grand Finals and 15 finals, with a four-year hiatus in between it all, Blair has stood tall amongst it all, contributing to the better of the club on and off the field. Whether it’s through his work ethic, his courage and his willingness to sacrifice himself for his teammates on the field, or his dedication, care for others and wise head off it, Blair is a standard bearer for those who have shared the ride with him. A favourite of the Magpie Army. In 2018, things haven’t been as easy for Blair. For a man who barely missed a beat for so many years, he has had limited senior opportunities in recent times, managing just two games during Collingwood’s run to September. Although named as an emergency on several occasions, Blair was unable to lock down the spot he coveted. But it didn’t diminish his effort, his output on the training track and on the field or his care for the club. He ran second in the Joseph Wren Memorial Trophy as Collingwood’s best-and-fairest in the VFL, and was singled out by senior club figures for his efforts in the weeks bookending the Grand Final for the way he had applied himself despite missing out on selection. “To Blairy and Ben Reid, who haven’t had years individually they’d like to have had, but maintained a team first focus. These are examples of people who were prepared to give all of themselves for the team and club,” said coach Nathan Buckley during his Copeland Trophy speech. “Blairy's shown that attitude all year,” Leadership and Culture Manager Nick Maxwell told reporters during Grand Final week. “He's been in the squad almost every week but keeps showing up and works to be a part of it this year. From joint leadership of the Coleman Medal after three rounds of the 2011 season to winning a flag in just his 12th senior game, there has been plenty to celebrate. His five goals on the night of the flag unfurling against Carlton in 2011 and his match-winning goal on ANZAC Day the following year will always be remembered fondly by the Magpie Army. Blair gets boot to ball to kick the match winner against Essendon on ANZAC Day, 2012. In recent years, he’s celebrated his 150th game with a win on the Gold Coast and recently became a father to his newborn son, Ziggy. And that flag? Well, it was special for everyone. But for a 20-year-old who had to fight tooth and nail for a spot on the rookie list less than two years earlier, it will always have its own golden glint. “I think someone pointed out to me after the Grand Final that Brad Johnson had just retired after 350 games and never got to play in a premiership,” he told The Age’s Rohan Connolly early the following year. Blair enters the Melbourne Convention Centre on Grand Final night, 2010. It won’t be the same without our man in the No. 11. For a start, we won’t be hearing Blink-182 in the gym any more, and the likes of Steele Sidebottom, Ben Reid and Jeremy Howe will be without one of their closest allies. But the deeds done and goals achieved by Blair throughout his 10 years at the club will stand the test of time. Thanks for everything, Blairy. Good luck for all that’s to come. Jarryd Blair is chaired off by Darcy Moore and Jordan De Goey after victory in his 150th game against Gold Coast in round 17, 2017.